Temperatures in Prague over the past couple of weeks have dipped dangerously low. Sadly, a reported twenty-five people have died due to the deep freeze. Bloudící kavárna VeloBloud (Wandering Camel Café) is a “tri-cycle borne” café that is currently campaigning on IndieGogo to establish itself in Prague and other cities throughout the world as ice cream and coffee vendors with a social conscious—they will employ the city’s homeless to sell the frosty treat. But the group has given up on ice cream for the moment to tackle more pressing charitable work: collecting warm winter coats for those without. 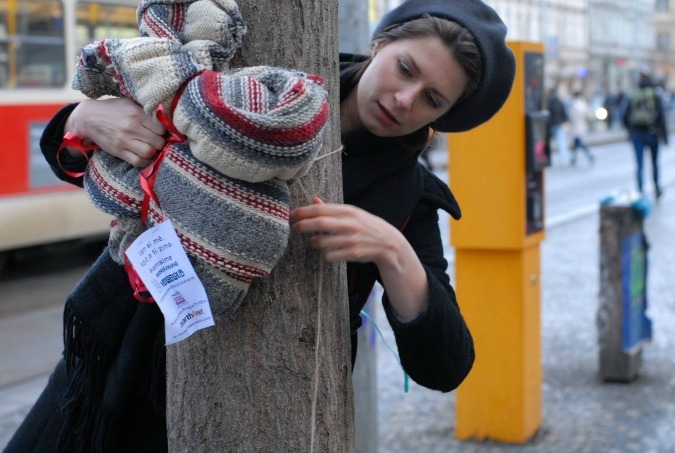 The group is currently organizing meet-ups throughout Prague where participants tie bundles of coats, gloves, and scarves to trees. The next event is planned for Saturday January 28 at Cafe Ouky Douky (Janovského 14) at 3 p.m. Yet another group, Daruj Kabat (Give a Coat), sprung up a little over a week ago. Organizers of the Dejvice-based initiative were met with obstacles, however, when vandals removed coats and clothing from donations boxes and threw them in the trash. The group approached Prague 6 officials for help and as of today the project is up and running again with city-donated boxes and wardrobes stationed at Vítězné náměstí. Last spring we reported on the opening of Prague’s first public wardrobe. 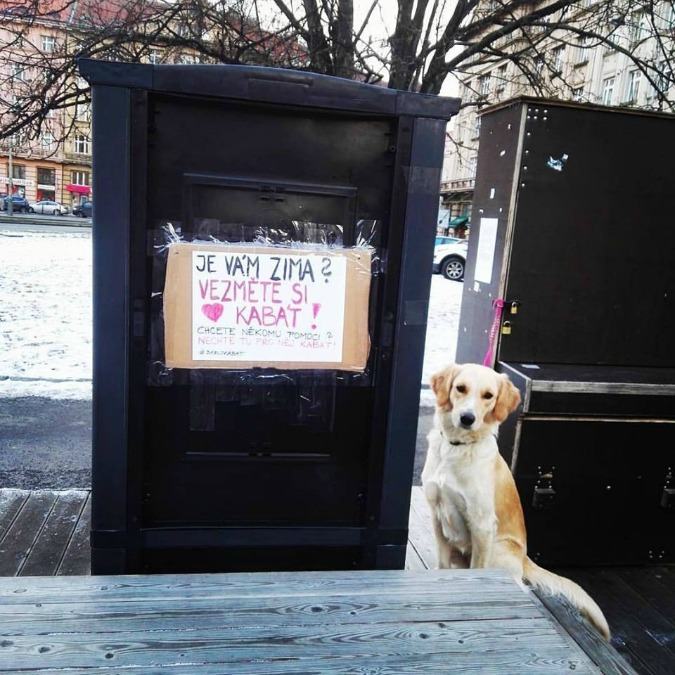 Now several groups have set up community wardrobes at various points around Prague where people can leave unwanted clothes for those in need. 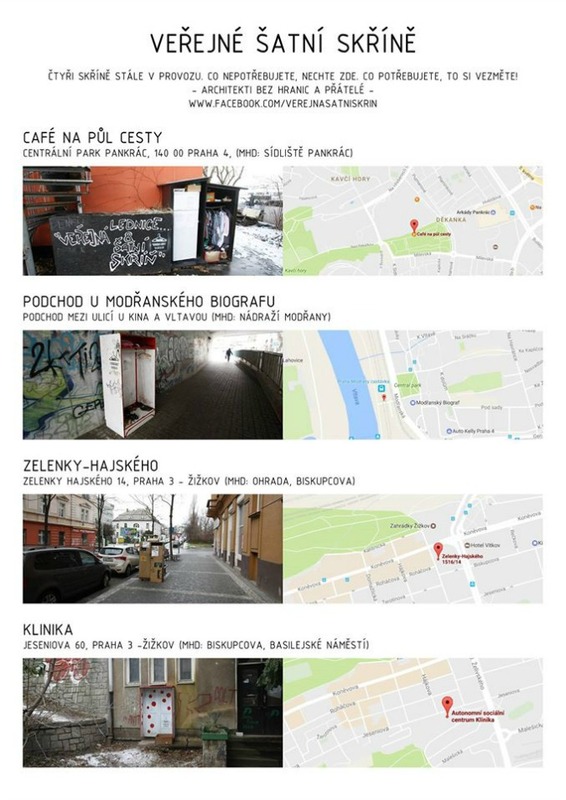 The initiative, organized by Architects without Borders, has compiled a handy map that pin-points all of the drop-off locations among them Žižkov and Pankrac. Veřejná šatní skříň Facebook page. On Sunday, January 22, this outreach organization will man the desks at Prague Thrift Store (Šumavská location) with all the revenue from the day going to their activities which include finding food, shelter, and clothing for those who live on the streets. Volunteers will be on hand to field questions on how you can get involved with helping the homeless all year round.